The least favorite part of the chaplain's job. The jail has asked me to inform inmates when a family member dies. I remember thinking that I would probably not have to do that very often so I said OK. It probably happens at least twice a month. After a short time I decided it would be best if I had to inform a female inmate of a death, I would ask Gail or May to do it. Marvin, Cliff, John, Skip and others have helped me take care of the bad news for the male inmates. I look for any excuse to get out of it. Most inmates know that if you are requested to go to the chaplains office it's bad news. I always make sure there is a box of kleenex on hand and pray that God will give me the right words to say. After we give them the bad news we are allowed to let them make a phone call. You never know what they are going to say. One time the jail called and said they had a 23 year old male who had just been arrested and he had told them his mom had just died. He was so upset that they called me in to try to calm him. My father had just died and I felt so sorry for him that as soon as he stepped in the office he saw the tears rolling down my face and he started crying also. He started telling me what a loser he was and what a bad person he was. I asked him if he wanted to use the phone but I couldn't figure out why he seemed preoccupied with telling me how bad he was. Then while he is still crying, he tells me that he is a liar and that his mom had not died, he had known he would be allowed to use the phone and wanted to call his girlfriend. He said that when he saw my tears it broke him. "No one has ever cared about me except an aunt I have in Chicago." She always told him he needed Jesus. I asked him, "What do you think you need?" He said, "I need Jesus." After he had a heart felt prayer I asked him if he wanted to use the phone. He called his aunt in Chicago and even I could hear her yell "PRAISE GOD!" Another time I told an inmate his mother had died. His reply was "Great, who's going to take care of my dog." Many times we have to tell more than one inmate about the same death because there are several relatives incarcerated. Once an inmate told the guard that his 2 year old son had just passed away. When I let him use the phone he called his 2 year old son and talked to him for quite a while. He didn't feel bad at all about lying in order to use the phone. When I informed the guard about that he said, "He will wish he hadn't done that." I'm not sure I want to know what the guard meant by that. Since then I try to check and verify that there is an actual death in the family. The hardest one I ever had to do was to tell a mother that her daughter, just down the hall in a different cell block, had died during the night. The jail called me in the day after I told her and said that after hearing the news, the mother tied a sheet around her neck and the second floor railing and tried to hang herself. I spoke with her afterwards and asked her if there was anything I could do to help. She asked me if I could get her a copy of her daughter's obituary and the jail allowed me to do that. She was so thankful. What ever it takes Jesus. I was given the first 4 lessons by a peer. He gave me little information about this course. He said, "there are 50 lessons & a free Bible." I wrote on the back of the last envelope asking what I recieve upon finishing this course. Some courses I've done give certifacates. I am a Poor Prisoner. Only my saviour, His Lamb are doing this time with me. I've been looking for a school that I can get a Diploma from. I've been in the word for 40 years, 20 of those years have been in prison. THE answer to his question is NO he will not get a diploma and Yes he was sent a Bible. Thank you for your little note and words of of encouragement. 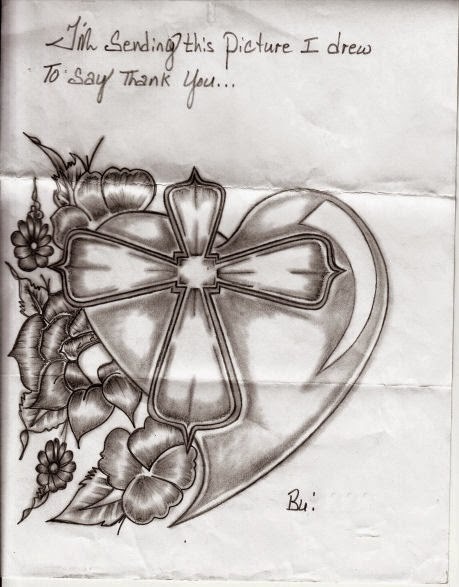 It is not often that I receive any type of correspondance from anyone and when I do get something I treasure it. Please keep me in your prayers and ask the Church to do the same. I am struggling with many things right now and Satan is throwing punches at me any way he can. I am also on the verge of going back to court concerning my case and I am hopeful that I will be granted credit for all of the time that the judge actually granted me at my sentencing. Please know that you, as well as the Church are in my prayers. I thank you and everyone for your prayers and for your love through Christ and for the time you all spend steering people behind these fences, walls and bars, to Christ. May the Lord continue to Bless all of you. We get a lot of what we call envelope art as a lot of our students will elaborately decorate the envelopes. There must be a lot of free time in prison. Thank you for sending me the Bible. I am really pleased with it. I could read and learn about my father who is trying to save me. I am ready to committ my life over to him. As of now I think that would be best before it is to late. So if I could I would surely love to continue to study about my father in heaven. So once agin thank for everything you are about to do for me. And may God bless you also. Thanks Maurice. Thank you so much for seeing my sincerity and taking your time to teach me Gods word. I've been so sick with sin for so long. Then confused by family members trying to tell me what Jehovahs witnesses doctrine are and confusing me. I pray you will help me to understand Gods word. The Trinity, Heaven, Hell, seem too big for me to get my mind around. But how I long to understand. As you are teaching me in the study course, I do Believe in Jesus! I want to live for Him. Please Help Me. I accepted the Lord on 12-24-14. It as at that time that your minitry was given to me to write by the chaplin here. I know this is a gift from God. I take this with grave seriousness. Thank you for the wonderful gift. I shall treasure this Bible you sent. I know a lot of guys just write for a Bible or whatever, but not me. I had a Jehovah's witnss Bible and it is different and does not even say, "grace" or "saved" anywhere! I've gotten that out of my house now and I'm grateful so much I don't even have words. I look forward to the next courses! Pray for me as I shall pray for you. Just a note, here at Berean we do not ever push one religion over another we just send out a Bible and studies. That letter had a lot of exclamation points he is hoping we get the message he is thankful. That is enough typing for one morning, work awaits. More letters will be posted tomorrow.